Patra's Other Place: Did you ever have a childhood wish come true? There were two things I REALLY REALLY wanted when I was a kid - a dolls house and a full set of 72 Derwent colour pencils. I don't recall any of my other friends having a dolls house, but I saw pictures of them in books, and used to dream about how I would set mine up if I ever got one. My parents could not afford to buy one, and although my father was a very practical man around the house as far as the garden and maintenance went, he wasn't a carpenter, so he couldn't make a dolls house for me. 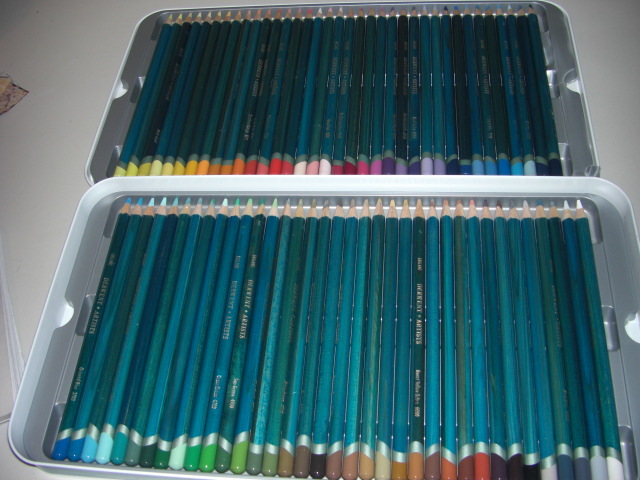 As for the Derwents, all the kids at school lusted after Derwent pencils. Nobody had a set of 72 (or if they did, they weren't allowed to bring them to school), one or two kids had sets of 24 or 36, and I had a set of 12, which all had my name carved into the top by Dad so they wouldn't go missing! Those of us who had any Derwents suddenly acquired 'best friends' in art or drawing classes, as kids wanted to borrow a particular colour for something they were drawing. When I enrolled in the sketching workshop a few weeks ago, we were given a list of requirements, which included a choice of Faber Castell or Derwent pencils. I Googled them both and quickly discovered that Faber Castell was WAY out of my price range, even on eBay, so I went looking for Derwents. Cutting to the chase, I won an eBay auction last week for a set of 72 Derwent Artists Pencils, for well under the retail price. They arrived today, and I felt just like a kid again - wanting to try them all out on a piece of paper just to see those gorgeous colours materialise! Yes I remember those Derwent pencils and even in Primary school I was an anglophile and loved the picture on the front. I hope they are still made in England. I think a box of 24 was the most I ever had, never knew anyone with 72. I'm sure there is a doll house out there for you somewhere, keep looking. Hard to smuggle into the house though, not like a piece of fabric you can add to your stash and say it's been there for years. ooh! gorgeous colour pencils!wonder what you're come up with using them!nowadays I reckon kids would have virtual online dolls houses..like those electronic games where you can build multi level buildings with people in it who shop,cook,garden and buy things!I just looked at a "sylvanian families" dolls house recently at a toy shop and it was so expensive!